As we read this story, let’s keep in mind the idea that it is possible to curate spaces from places other than a position of power. 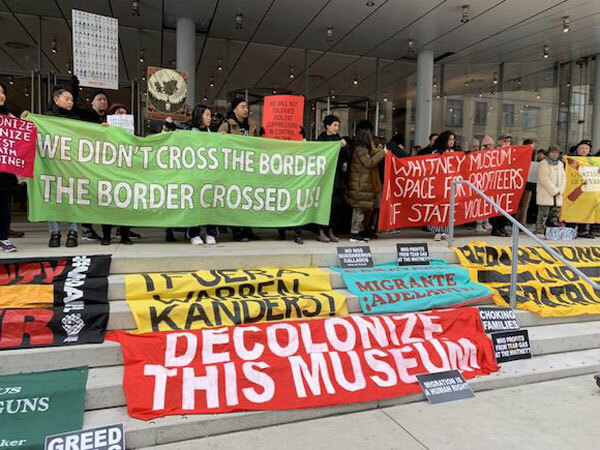 Tonight, artists and activists with the group Decolonize This Place (DTP) will gather at the Whitney Museum for an evening of protest and “freedom songs.” It is the second of nine weeks of planned protest events at the museum; they started last week by holding signs and using an illuminator to project their message on the side of the museum. Their message is that vice chairman Warren B. Kanders must be removed from the Whitney Museum’s board. Kanders owns and runs a company called Safariland that manufactures, among other things, tear gas canisters; it is Safariland’s canisters that (according to DTP) were used on protestors at the San Ysidro border crossing in California last November, as well as in Ferguson and Standing Rock. As NPQ reported in December, 100 staff members at the Whitney signed a letter (which bears reading in full) to the museum’s leadership, explaining how state violence impacted their communities and that they were “sick to [their] stomachs” upon learning of the Whitney’s involvement with Safariland. The letter criticized museum leadership’s silence on the matter, and by now both the museum and Kanders have responded. Museum director Adam Weinberg’s letter cited the oft-quoted description of the Whitney as “a safe space for unsafe ideas.” He acknowledged the many crises afflicting the world at present but said, “The Whitney is first and foremost a museum. It cannot right all the ills of an unjust world, nor is that its role.” He acknowledged and celebrated the progressive work of the museum and the artists it showcases, and stated, “we each have our critical and complementary roles: trustees do not hire staff, select exhibitions, organize programs or make acquisitions, and staff does not appoint or remove board members.” Essentially, he called for civility and adherence to established rules; NPQ readers may want to read Cyndi Suarez on over-emphasized civility and the harm it does to communities of color. Museum director Adam Weinberg issued a response in which he essentially told the concerned staff to know their place, do their jobs, and stay in line. We commend the efforts of the Whitney staff, and recognize the courage displayed and the risk they have taken in organizing and speaking out…the entire institution of the Whitney faces a broad crisis of legitimacy.